Potential part defect causes halt; U.S. plant not affected. Subaru halted production at its plant in Japan several days ago due to a potentially faulty component. Its U.S. plant is unaffected at this point. Subaru slammed on the brakes on production at its plant in Japan, which accounts for 60% of its global production, due to a potential defect in a power-steering component. The Japanese automaker hopes to restart production by Jan. 28, after it determines the cause of the problem. The company put a halt to production the night of Jan 16 after the problem was discovered, according to the Asahi newspaper. 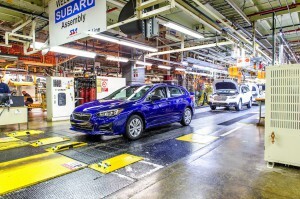 For now, only the Forester, Impreza and XV (a Japan-only vehicle) appear to be affected, but the company is reviewing its processes to make certain since its other vehicles are also built on the same production line. The company does not believe that its U.S. plant in Lafayette, Indiana, has been affected and remains on its normal production schedule, officials noted. That plant produces the Outback, Impreza, Legacy and its hot-selling Ascent large sport-utility. 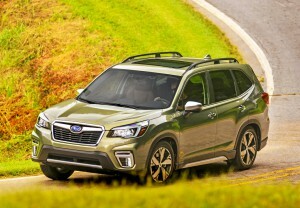 The availability of the Subaru Forester is likely to be impacted by the company's shut down of its plant in Japan. Subaru is still attempting to determine the reason for the defect, and that it may have impacted as many as 10,000 vehicles built in late December until the line was halted on Jan. 16. The company said it would take “appropriate” steps to ensure the affected vehicles were safe. Customers are likely to see delays as a result of the problem, the company added. Profits for the Japanese automaker have dipped each of the last three years, despite it setting new U.S. sales records each of those years. That said, officials revealed plans to produce 650,000 vehicles in Japan and 1.03 million globally this year, up 1% on the previous year. It has forecast record global sales of 1.08 million vehicles, of which 700,000 are expected to come from the profitable U.S. market. After its strong results in 2018, it had good reason to expect an uptick. Subaru of America reported record-breaking sales of 680,135 vehicles for the 2018 calendar year; an increase of 5% over the previous annual record of 647,956 vehicles set in 2017. This marks the 10th consecutive year of record sales for Subaru of America and 11th consecutive year of sales increases. This entry was posted on Wednesday, January 23rd, 2019 at and is filed under Asia Pacific, Automakers, Automobiles, Business, Earnings, Executives, Markets, Personalities, Quality and Reliability, Safety, Sedans, Subaru, U.S./North America. You can follow any responses to this entry through the RSS 2.0 feed. Both comments and pings are currently closed.